HOWYWOOD KINDERGARTEN! : Fun Idea: Tally your local football team's wins and losses! Fun Idea: Tally your local football team's wins and losses! Here's a little something FUN to add to your calendar routine! 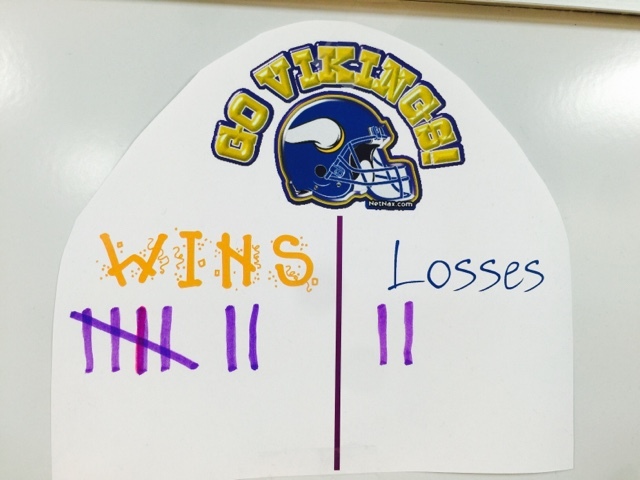 Choose a favorite football team (could be your high school team or a favorite NFL team) and use tally marks to track their wins and losses as a class. It's HILARIOUS and so sweet how excited kids will get to tell you on Monday how the team did! And there's usually one or two kids who are REALLY into football and can give you serious details about the game. I learn a lot from them and can take that info home to impress my husband! Ha! I recommend football more than other sports like baseball or basketball because those others have too many games to track. Football is just right with about a game per week. The scores are perfect for talking about which number is greater and less than, etc. So there ya go- just a FUN idea! Colorful & Fun WOW Work Display!